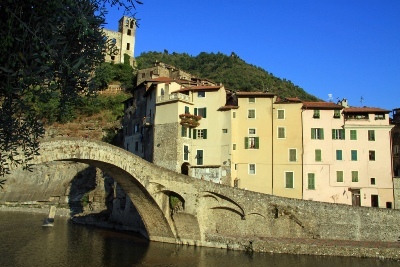 With these Educational Excursions to see Medieval Ligurian Riviera locations you will be able to wonder at fascinating historical and artistic marvels that date from the medieval era. In the Middle Ages, Liguria, under threat from the Saracens, saw the rise of stone villages perched on the slopes of the Maritime Alps: today these villages are real open-air museums. Taggia, a town with a tradition of olive oil production, has a beautiful old historic center, featuring the convent of San Domenico. The convent was founded at the wish of the Dominican Padre Christopher of Milan in 1459 and contains many valuable paintings. Dolceacqua, the pearl of Valle Nervia, is a delightful medieval town, enhanced by an ancient humpbacked bridge and the ruins of the castle of the Doria family, which has recently been restored and is now used as a venue for concerts and events.